and a little history behind the collections for sale on Simitra's Exquisite Things. In this section you will find combs and hair accessories dating from the late Georgian and early Victorian periods up to the early 20th century. These 110 years cover many different styles and it would take an entire book to describe them all! 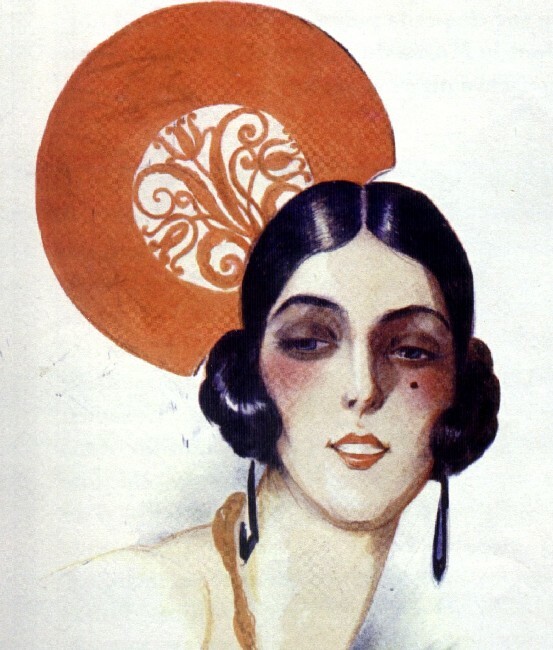 In time I hope to write a series of guides on the hair accessories of the Georgian and Victorian periods, similar to those covering the Art Deco and later periods which you will find under the ARTICLES section. 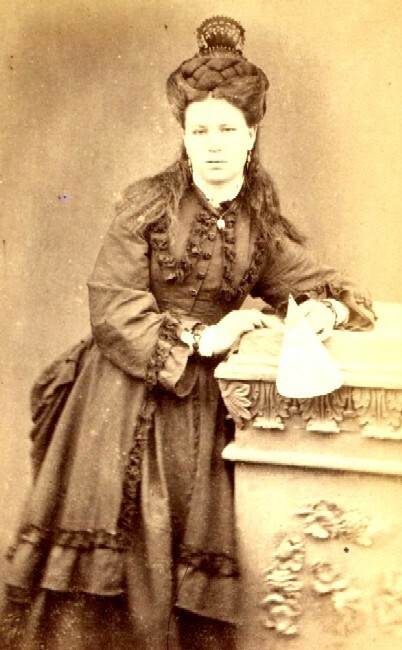 In the late Georgian and early Victorian periods (1800-1840) ladies favoured high mantilla style combs similar to those worn in Spain, made from carved tortoiseshell, horn and filigree metal. You can read more about Spanish mantilla combs in the two special guides I have written covering this subject. You will find these in the ARTICLES section. The mid Victorian period, lasting from 1850 – 1880, was an era of large and elaborate hair ornaments. 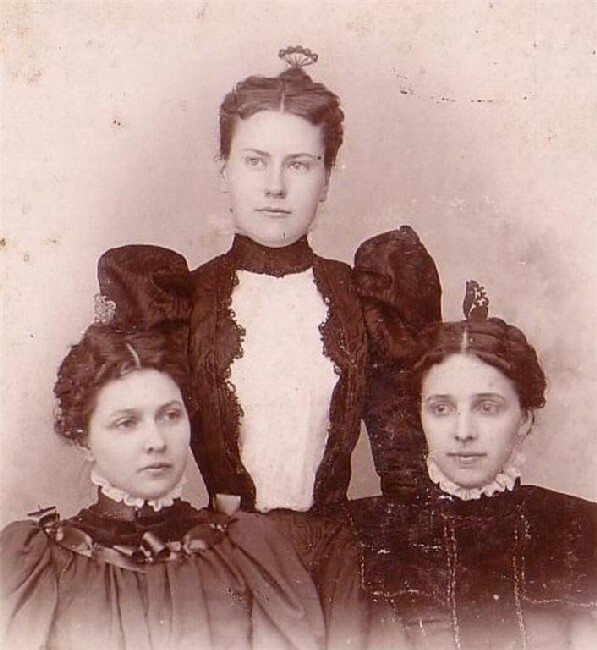 Fashionable hair styles were extremely complex and required masses of false hair. 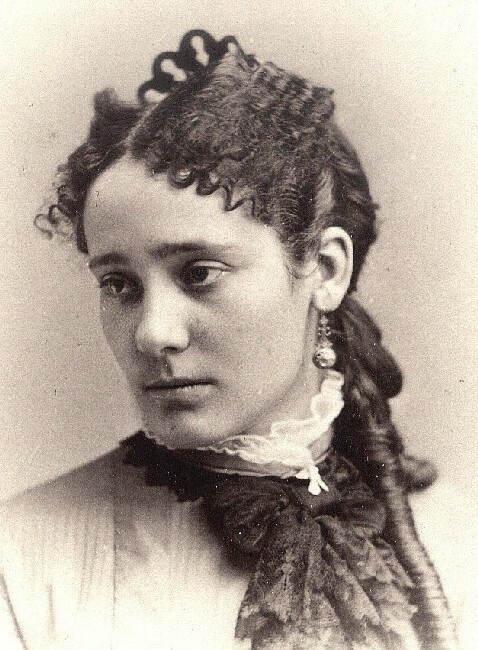 Large and elaborate combs and barrettes were useful in concealing the join between the wearer’s own hair and the added tresses, and were often used for this purpose. Sets of matching combs and hairpins were used to keep the hair in place, while other ornaments served a merely decorative purpose. The most desirable and typical of these have the heading mounted upon a rotating hinge, which allows it to be adjusted into various positions. The sheer range of materials used for these hair ornaments is vast; jet, ivory, tortoiseshell, horn, coral, and polished steel were some of the favourites. From the late 1860s the invention of celluloid provided a cheaper substitute for expensive natural materials such as tortoiseshell and ivory. From the 1890s the fashionable hairstyle gradually became simpler, and the ornaments used to adorn it lighter and more delicate. Hair accessories of pierced silver, real and faux tortoiseshell and filigree adorned with butterflies, flowers, bows and other “sentimental” motifs were the ornaments of choice. Often these were combined with tall upstanding feathers in the type of hair accessory called an aigrette, which gave both height and dignity. An influential movement which evolved near the end of the 19th century was Art Nouveau. The Art Nouveau style was a reaction to mass production and an attempt to return to the medieval idea of the artist-craftsperson who both designed and made the object. This style drew heavily upon nature and natural forms for its inspiration, and often featured figural forms such as female heads, birds and winged insects. Many of these ornaments were hand made, rather than mass produced like the more popular hair accessories. By 1910 Art Nouveau design was becoming more formalised and evolving into the highly influential movement which we now call Art Deco. An essentially decorative style of the years following the First World War, Art Deco reached its peak in 1925 at the Exposition des Art Decoratifs et Industrielles Modernes in Paris, whence the name comes. By clicking on the button marked ARTICLES you will find a series of very detailed guides I have written on the hair accessories of the Art Deco period. This new style was marked by symmetry, geometric shapes, and general stylisation of decorative motifs. 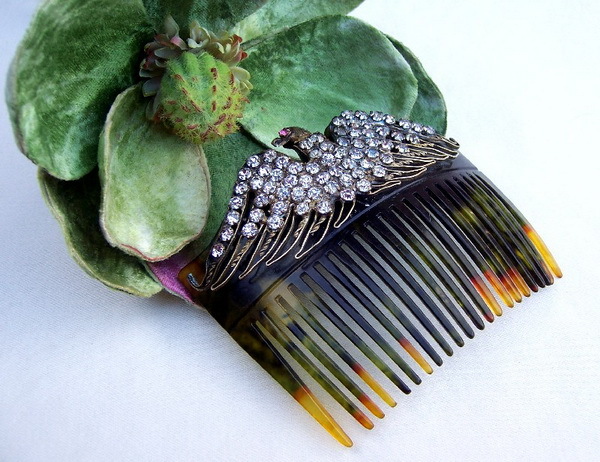 Many Art Deco hair combs are in pure, abstract forms, with little surface ornamentation for a very powerful effect. The strong contrasting shapes – ovals, squares, or oblongs - show a deep appreciation and understanding of the potential of the material, whether plastic, metal or organic. Art Deco reflects the qualities of contemporary art movements, whereby the emphasis was upon the medium, and the process of production, rather than the intrinsic value of the materials. It glorified the new technology of the plane and automobile, and the ethos of speed, power and movement. Art Deco evolved as the period advanced. From 1910 into the mid 1920s we see the popularity of huge Spanish style mantilla combs, which were often quite elaborate. 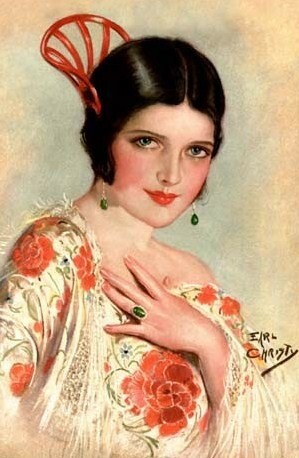 However from the late 1920s many women cut their hair short and hair accessories grew correspondingly smaller. In the 1930s we find the most severe and geometric manifestation of the style, sometimes known as Streamline Deco or Deco Moderne. This favoured small and modest hair accessories in strict geometric shapes, simply decorated with clear rhinestones or enamel. From the later 1930s we find that the fashions were again changing. The severe angular lines of pure Art Deco Moderne are becoming compromised by more curved, naturalistic forms. A taste for more colour and elaboration in dress and personal adornments was returning. Towards the end of the 1930s we find baroque styles creeping back into jewellery and hair ornaments under the influence of the style known as neo-Baroque Moderne. 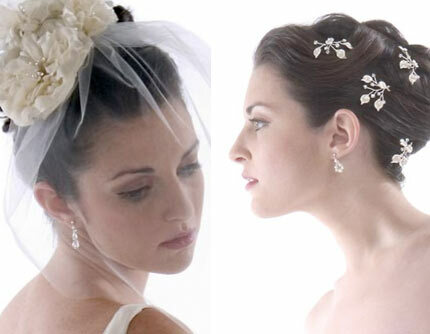 In this section you will find modern hair accessories of all kinds which have never been worn. The HOT look for the season as decreed by the fashionistas is a palette of classic versatile neutrals, punctuated by splashes of invigorating brights. Bright clashing shades and patterns are the new order of the day. Printed patterns, such as animal prints and Retro abstract florals, are seen not only upon clothes but also upon accessories of all kinds. Vintage style dolly prints, and sprigged patterns reminiscent of Laura Ashley can be found in giant hair clamps and barrettes. Other accessories sport abstract prints with a global feel using earthy African tribal symbolism. Americana too is popular in patriotic red, white and blue. The Retro look, from the 1950s through to the 1980s, is another fashion trend for this fall. So get out those big glitzy Dynasty look combs and barrettes to dress up a plain outfit. A very popular look for autumn 2008 is the Safari style. So, for hair accessories think Jungle. Ethnic influences, from oriental inspired to Egyptian elements, are big in 2008. To stand out, look for a big hair accessory with an exotic animal or ethnic design. Bold jewel colours work perfectly, for example turquoise against gold. This section contains hair accessories from many lands. We particularly specialise in Japanese Geisha type hair ornaments, popularly known as kanzashi. 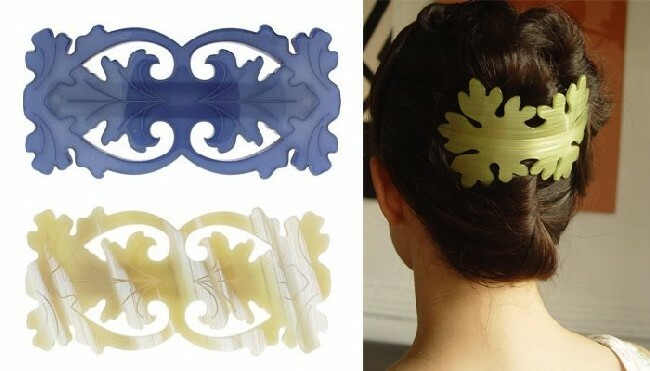 To learn more about these beautiful hair ornaments is sure to read my guide on Kanzashi. Some 400 years ago, Japan took the simple hair comb and transformed it into an elegant beauty accessory that became a work of art. 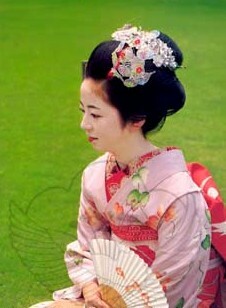 Japanese kushi (combs) and kanzashi (hairpins) became expressions of a woman’s character, social class and marital status. Until the beginning of the modern era, decorative combs and hairpins, known by the collective name of kanzashi, have been an important part of Japanese fashion and social culture. 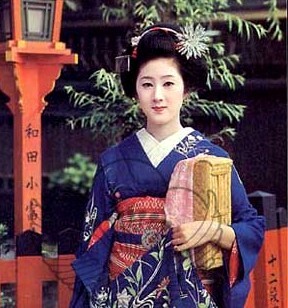 Western style jewellery such as rings, necklaces and bracelets was not worn in Japan until the modern era. Instead, women decorated their hair. The elaborate traditional hairstyles required a tremendous amount of time and money to maintain. Indeed the value of what a woman wore in her hair often far exceeded even the cost of the beautiful silken and embroidered kimono she wore on her back. The word kanzashi itself is also something of a misnomer. Nowadays it is loosely used as an umbrella term to cover all kinds of Japanese hair accessories. However there are a number of distinctive types. Kanzashi is the name properly given to hairpins which can vary from the plain and simple to the most elaborately jewellery creations with long dangling pendants. Combs or kushi can also range from simple tortoiseshell to those which are beautifully inlaid with mother of pearl, coral and other semi precious materials. Most desired by collectors are the so-called geisha sets, which comprise a full suite of hair accessories, supplied in a fitted box. Kanzashi are fascinating objects to collect and are available in a wide range of materials and styles to suit every pocket. In this section you will find jewellery of all kinds. Two particular areas in which we aim to specialise are those of vintage and tribal ornaments. The HOT look for the 2008/09 season as decreed by the fashionistas is a palette of bright clashing shades and patterns. Printed patterns, such as animal prints and Retro abstract florals, are seen not only upon clothes but also upon jewellery and accessories of all kinds. 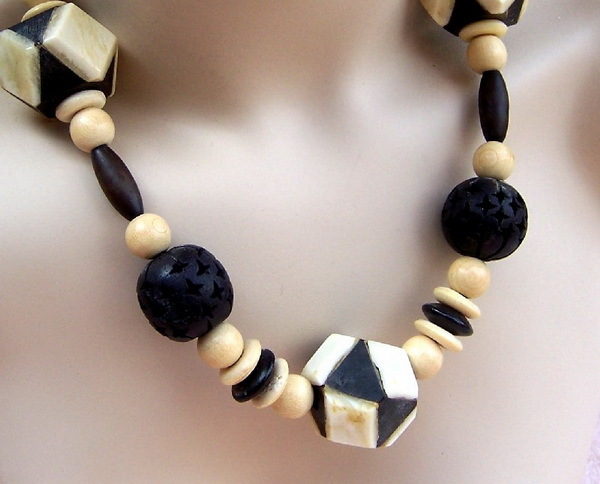 Other accessories are styles to give a global feel using earthy African tribal symbolism. The Retro look, from the 1950s through to the 1980s, is another fashion trend for this fall. So get out that glitzy and glittery Art Deco to Dynasty look pieces to dress up a plain outfit. A very popular look for the fall/winter 2008/09 is the Safari style. So, think Jungle. Ethnic influences, from oriental inspired to Egyptian elements, are big in 2008. To stand out, look for a big important accessory with an exotic animal or ethnic design. Bold jewel colours work perfectly, for example turquoise against gold. One big fashion which has already taken off is the trend for tribal beads and costume accessories, whether wooden or bone or plastic. The look is chunky crafts inspired, ethnic arts and crafts and almost what one might imagine a member of a tribal culture might don. In necklaces contemporary carved acrylic beads in rainbow colours are teamed with natural materials like wood, seeds, bone and mother of pearl. 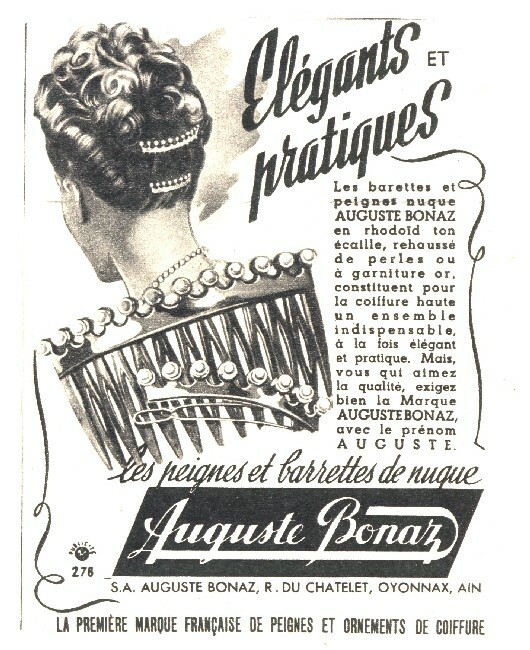 The term 'Spanish mantilla combs' is often used as a kind of umbrella category for any decorative hair comb with a high upstanding cresting that rises up proud from the top of the head when the ornament is placed in position. However, the Spanish mantilla comb or Peinita, to give it the correct name, is rightly that comb which is part of the beautiful and traditional native dress worn in certain parts of Spain, notably Andalusia. However these combs are also worn in other Spanish speaking parts of the world such as Mexico and South American states. We are all familiar with this kind of Peinita, where the enormous cresting rises anything from eight to twelve inches above the wearers head, and supports a beautiful lace veil. From their native land the wearing of these beautiful and unusual ornaments spread across the world, to Europe and the USA. 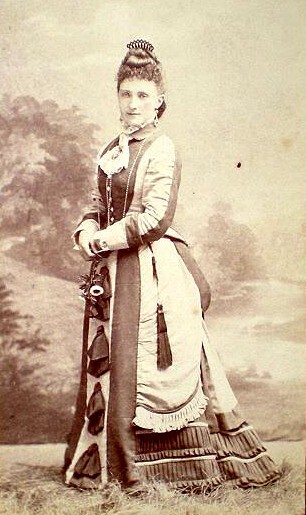 They have been high fashion in various historical periods throughout the 19th and 20th centuries. Mantilla combs are still to this day a favourite choice for brides of Spanish descent, while smaller versions are favoured by those interested in Flamenco or other forms of Spanish dance. In the past these beautiful combs were made from hand carved tortoiseshell, horn or filigree metalwork. 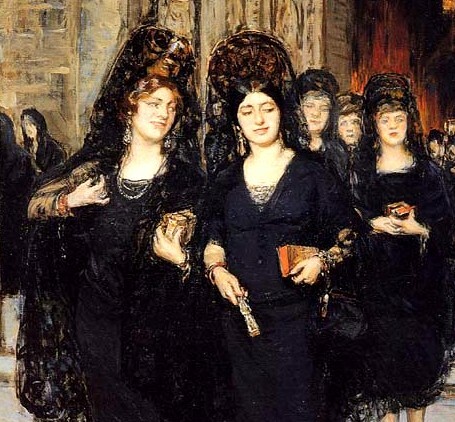 Today the mantilla comb continues to be a popular choice for dressing up at parties or pageants, but is more likely to be made from faux tortoise effect celluloid or one of the modern acrylics. To learn more about the history of these beautiful hair ornaments be sure to read my two guides on Peinitas in the ARTICLES section. The word RETRO is short for retrospective,and is a modern term used to describe things of a bygone era. It was coined by the fashion and culture press, and suggests the revival of older but relatively modern fashions. RETRO is currently enjoying a strong fashion revival. For this reason RETRO hair accessories appeal not only to collectors but also to modern day wearers. In our store we use the RETRO category to refer to old-but-newer hair accessories from the late 1970s and 1980s onward as these do not yet have sufficient age to be truly called vintage. Many of the items we sell are old-store-stock which have never been used or worn. Hair accessories of the 1970s show a wide range of cultural inputs. A lingering influence from the Hippies led to a fondness for natural motifs showing flowers, fruit and various animal forms. There was also a taste for decorative techniques like enamelling or engraving of the metal surface, and the use of unusual materials such as seeds, shells and rough cut minerals. The 1980s was, of course, the era of Dynasty, frankly fake jewellery and BIG hair. In this atmosphere personal ornaments like hair accessories could not be too big or too glitzy. 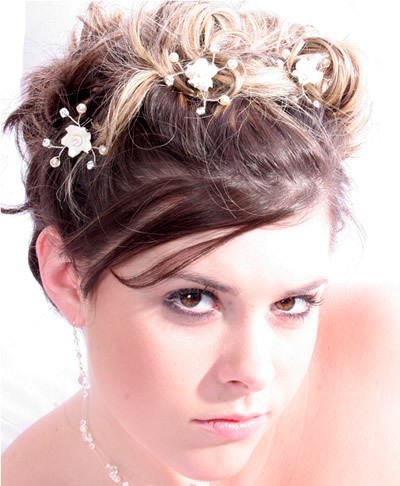 Decorative hair combs sparkle with huge fake rhinestones and drip with faux pearls. Alongside these we find a range of newer forms of hair accessories such as hair claws, prongs and banana clips done in a dazzling range of colours and designs. Plastic jewellery, oftenin eccentric patterns like animal prints, again became fashionable. You can read more about the hair accessories of this era in my guides to the 1970s and 1980s which you will find in the ARTICLES section. This store category includes hair accessories produced between the years 1940 and the mid 1970s. After a period of restrained geometric severity in the 1930s the 1940s saw the emergence of a taste for more colour and variety in personal ornaments. There gradually evolved a taste for an elaborate and colourful style which we call neo-Baroque. With the advent of World War II, fashion went into a kind of limbo in Europe. Paris came under enemy occupation, and consequently the production of fine jewellery and haute couture was badly damaged for many years. With newly developed techniques of mass-production, America took over from Paris as the leading exponent of stylish and innovative costume jewellery for the wider market. The impetus behind much of this design was supplied by Hollywood and the great film divas of that era. 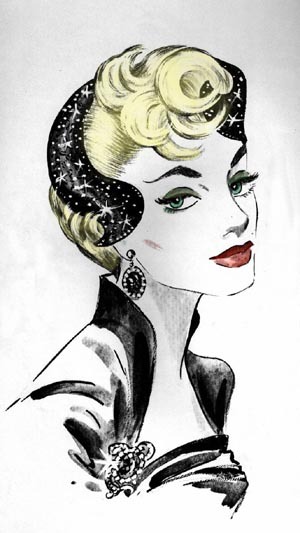 The 1950s showed two basic styles in hair accessories. The first was the Baroque or neo-Baroque which was pure glamour and glitz, favouring glittering rhinestones combined with coloured stones and materials, faux pearls and elaborate gold or silver tone settings. Such ornaments were worn predominantly for evening. The second was the Modernist style, an overhang from the Art Moderne of the 1930s. This was a more subdued but sculptured look, relying upon its shape and texture for effect, rather than added embellishment. This simpler and perhaps more sophisticated type of ornament was considered suitable for day wear. The 1960s saw a creative explosion in fashion design andpersonal ornaments, with many new influences coming from individual designer-craftspeople. Many of the ‘big names’ of the 1960s, some of whom went on to found their own fashion houses or companies, began as individual creative artisans marching to the beat of their own drums. 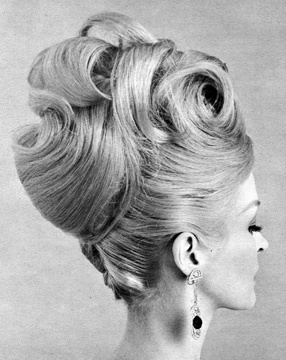 Bouffant hairstyles cried out for hair accessories and the industry boomed, with ornaments of all kinds being worn. Many continued to be decorated with rhinestones, particularly the multi-coloured Aurora Borealis variety which was invented in the late 1950s. Plastics appeared in black and white OP ART or brightly coloured acrylics in dazzling patterns. A third influence was that of the Hippies which lasted into the 1970s. Hair combs and barrettes acquired long dangling pendants adorned with beads, seeds or metal pendants. Side combs and barrettes were done as garlands, leaves and flowers. 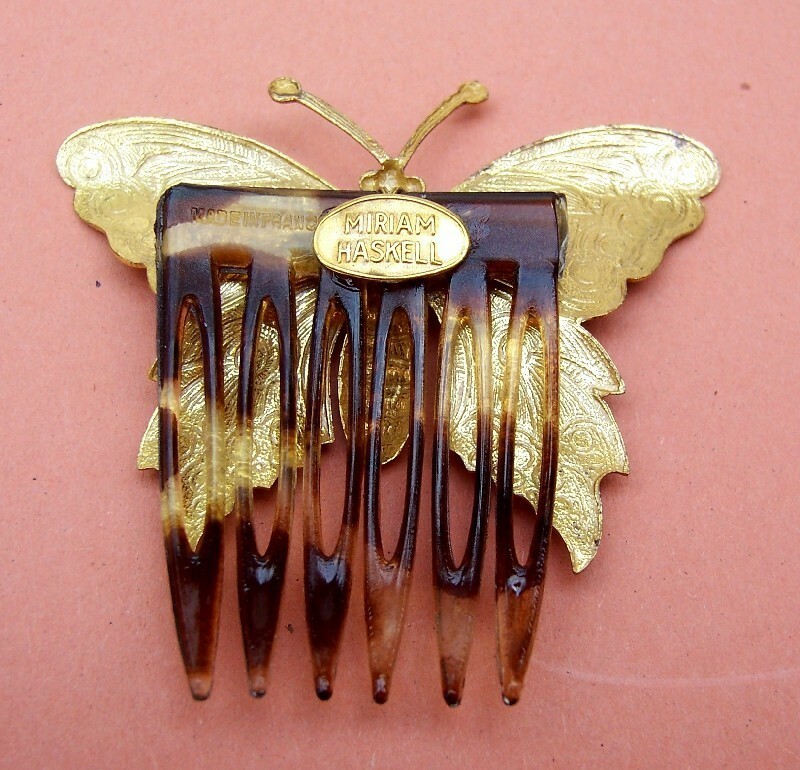 One of the most influential designers of the period was Miriam Haskell whose intricate hand wired combs and barrettes are great favourites with collectors. Ethnic influences were also popular, and the blockbuster film Cleopatra starring Elizabeth Taylor spawned a fashion following for Egyptian look hair styles and ornaments. 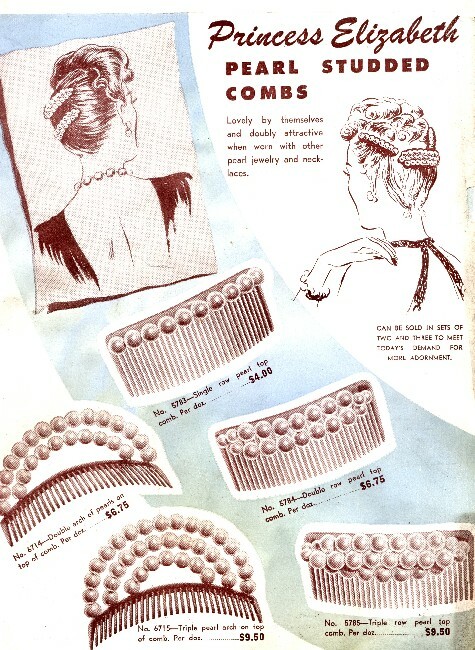 Be sure to read my series of guides on the hair accessories of 1930-1980 which you will find in the ARTICLES section. 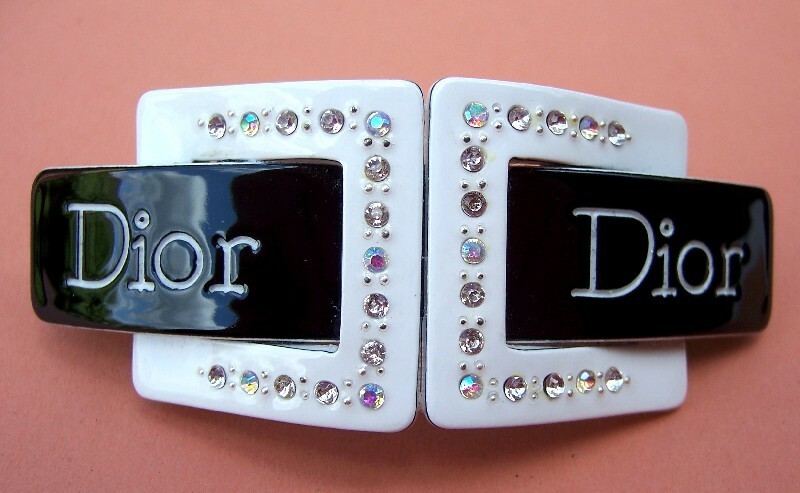 This category contains hair accessories of the type which are often called “designer” goods. We also include in this section artisan and hand made hair ornaments which are mostly one offs or experimental pieces. In a consumer led world people increasingly tend to define themselves by their possessions. One modern theory is that consumers buy not only a product but also the image associations of the product. Some products convey images such as wealth, glamour and sophistication. As designers and manufacturers strive to grow and publicise their own Brand Image the signature of the designer is an important element of that image which consumers seek to buy into. However in a world where people are increasingly concerned with sustainability other products reject the idea of Brand Image. 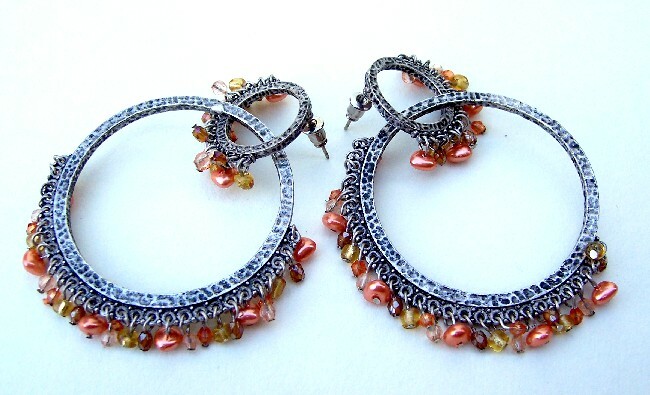 These are associated with craftsmanship, cultural tradition and skill. 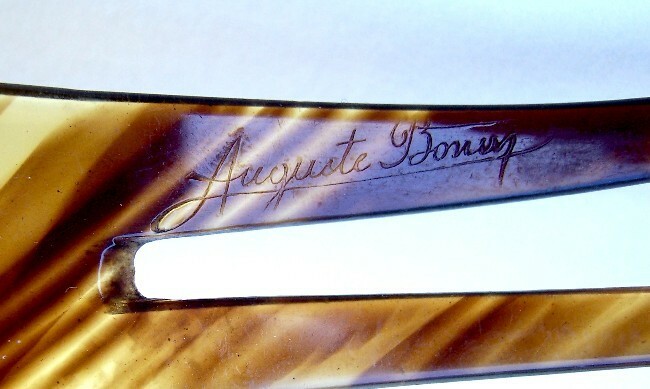 One of the premier names in vintage hair accessories is that of Auguste Bonaz, the premier comb maker of the Art Deco period. The easily recognisable Bonaz signature is always done in cursive script often accompanies by the legend MADE IN FRANCE. Over 7 decades of Bonaz workshop produced vanity articles in a number of styles, but always of the highest quality. Of more recent manufacture, the jewellery and hair accessories of Miriam Haskell have received a great deal of attention as modern collectables. In an age of mass production these articles are distinguished by a considerable degree of hand workmanship. 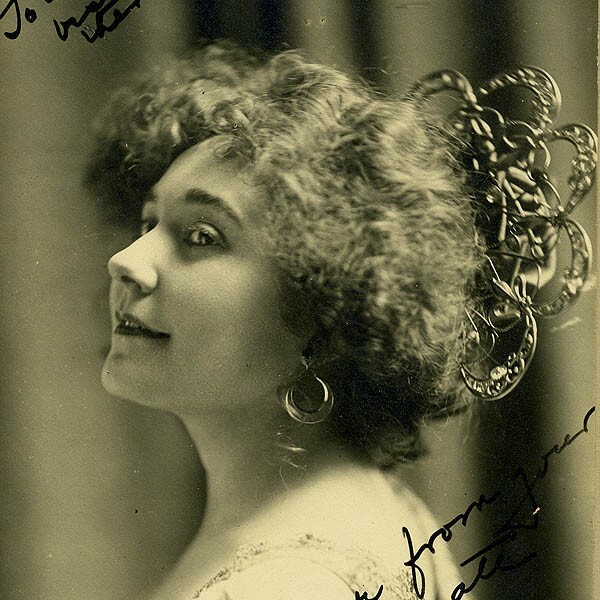 The backs of hair combs are easily recognisable by a small brass plate with the signature Miriam Haskell and the characteristic filigree flower shaped studs which hold on the heading. More recently the products of “Big Brands” such as Chanel, Dior and Louis Vuitton have been counterfeited in the Far East by Chinese manufacturers. It is ironic that manufacture of the authentic goods was outsourced to this part of the world to cut costs. Consequently a production and distribution line of fakes which exactly mirrors that of the authentic has evolved. Many of these hair accessories do not attempt to simulate genuine brands such as Chanel or Dior and are worn strictly for fun.